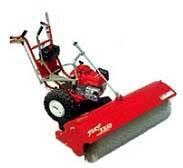 Hydrostatic Drive (variable speed; no gears). Working & transport speeds (variable). Runs on standard unleaded petrol. and surface. All are below 6 m/s. and surface. All are 92 db sound pressure or below. 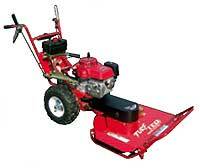 TurfTeqTM design and manufacture a range of walk-behind Power Rakes, Edgers, Ploughs, Brooms and Brush Cutters. 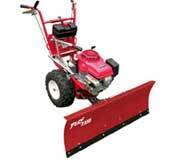 All units are self-propelled and use a Honda ® GXV390 engine with a hydrostatic transmission unit. 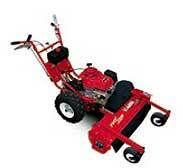 The modular design consists of a base power unit to which attachments can be quickly mounted. This allows the customer to purchase one unit to drive all the attachments, thus reducing overall purchase and maintenance costs. It also allows the attachment to be easily removed and re-installed when needed, in order to pass through gates as small as 28 inches. 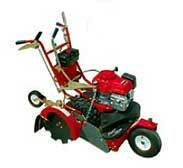 Honda powered tractor for garden landscape machinery UK, Ireland, Eire.